Anyone who has ever written anything, from school essay to holiday postcard to first novel to tardy blog post is familiar with the tyranny of the blank page. Enough has been written on that subject, and I am sure that plenty has been written on the subject of starting a garden from scratch on an empty site (not least on these pages). But has any gardener-writer asked us why the white sheet of paper is an object of dread yet the empty garden site gives us thrills of joy? Or, at least, it gives me thrills of joy. The realisation that the front garden needed redoing from scratch (again) came to me at roughly the same time as the realisation that I hadn’t written about my front garden for many weeks. At first I thought that my not writing about the garden was because I was too busy and tired from my day job. Then the busy period ended, but I still didn’t want to write about the garden. After all, what was there to write about? Once the tulips were over (and my garden does tulips very well), there was little else to revel in. My dear readers’ attention wouldn’t have been held for long by the single heuchara that looked all right, or the lonely Astrantia ‘Buckland’ that had come into bloom beside the Salvia ‘Caradonna’, in the one corner of the garden that looked relatively well. There wasn’t much to look at elsewhere, other than dying Narcissus foliage and a peony that refused to flower for the second year in a row. I was surprised by how poorly the front garden had looked in 2016, and again in 2017, compared with the floral exuberance I managed to produce in its first year, 2015. For surely the plants — and my expertise — should have been more established twelve and twenty-four months later. Was my successful 2015 just beginner’s luck? The photo below shows the garden in July 2017. Yes, it’s full of green at first glance. But the bare patches and general lack of flowers are noticeable on closer inspection. No amount of moving pots around can make up for the core faults. In the end, a chance remark by my neighbour solved the mystery of my diminishing garden. Our street is lined with beautiful mature sycamore trees that shade the front garden for a good proportion of the day in summer. My neighbour mentioned that in late 2014 the council had cut the trees significantly back in order to do works on the pavement. Hence, the garden received a great deal more light in 2015. By summer 2016, the trees had regrown to their original sizes. A second factor was that in creating the garden, the earth had been dug over entirely and all the large roots from the sycamores, and also the hedge that surrounds the garden, had been removed. Now these had likely grown back and were taking up all the nutrients and water that I was trying to offer to my own plants. Clearly the design I had made in 2015 and the plants I had chosen were in need of a rethink. I sat on the (now broken) bench with a notepad and made a list of every single plant in the garden, and whether it was doing well or whether it was failing. And importantly, if a plant was doing well, did I like it? Life is too short, and gardens are too small, to contain plants that you don’t love, however healthy and happy they might seem. Some, like the non-flowering peony, the oriental poppy whose flowers lasted about four seconds in the perpetual wind, and a woeful acanthus that was desperate for sun and nutrition, were clearly in need of a move to the sunnier and more sheltered back garden. Others, like my heucheras, hostas, ferns, meadow rue and alliums were perfect keepers. And what about plants I didn’t own but would do perfectly here? The RHS plant finder helped me seek out drought-tolerant shade lovers such as Liriope and Japanese anemones. And a helpful response to my email to the RHS for advice about topiariable (if that’s a word) evergreens suitable for my conditions gave me many more ideas for structural plants to consider. I am now at the stage of considering the layout of my small 6 x 8-metre rectangle. It needs to be both practical and delightful, making full use of the space while making it seem more spacious. I want to inject a sense of mystery and intrigue, a winding path, an archway to areas that are hidden from immediate view, and of course a small dark pool. What materials I will use, the eventual shape and how it will all come together is yet to be determined. I am extremely fortunate to have arranged a gap between work contracts this autumn, permitting me a good month or so in which I can undertake my garden planning and redesign. As the plans take shape and progress, there will once more be a great deal to write about. Hydrangea ‘Limelight’ with camellia and Cotinus ‘Dusky Maiden. Potted plants in the front garden do much better than those in the ground, because the trees and hedge cannot steal the nutrients. So lovely to hear the latest about your front garden. I inherited a garden that had obviously been well designed and loved but lots of shrubs have really grown too big and like your street’s sycamores are definitely robbing other plants. I am slowly reducing or removing them to plant more of what I would choose but it’s taken me 5 years to come to that realisation I shouldn’t hold onto the huge ones just because they are doing well. We did remove (cut down) some Leylandii at the bottom of the garden because they were so dark and beyond any sort of reduction. In the middle of them we discovered a spindly cherry and left that. It is now too big and oddly shaped from being starved in the middle of the conifers and I now believe it was a seedling of a bird cherry so not right for our small garden anyway. Next to it is a line of bay laurel, again a thug. However, we do need something there for privacy. What to do? Biting the gardening bullet and having it all out and replacing with more manageable plants is the right thing but a difficult decision, both financially and in terms of effort. I really look forward to your rethink and hope I can go for it in mine. Thank you for your long comment. It does take time and a lot of thinking to get to know a garden, and before you really know it, it’s impossible to make rational decisions. Large obstructions such as an unsightly hedge or too-large tree can also block the imagination, and once they’re removed it can be so much easier to let the imagination run free. I was stuck on the idea of my existing flower beds, until I completely wiped them from my mind and drew a blank rectangle on a page, and thought, ‘What do I really want here?’. Suddenly some brand new shapes emerged, and my final design is nothing like the existing one. Regarding expense… yes. Buying new plants costs a lot. I try to take cuttings wherever I can, including from willing friends. Patience here is key, but over time I find I can produce many of my own plants for free, if I am willing to wait for them to grow. Hard landscaping materials, unfortunately, cannot be multiplied any other way than from the purse. I am totally with you in that last paragraph about plants doing better in pots than in the ground. We have a lovely Japanese Maple in our enclosed terrace garden (was here when we arrived) but the ground all around is absolutely impossible to dig, and it is very dry. So I have a series of 5 large pots, all with a variety of lilies, acuba, annuals, Meyer lemon (that comes in for the winter) and all are thriving. I so agree that we need to take stock of the garden for not only what isn’t doing well…but what we really don’t want in there anymore! That is the wonderful thing about gardening, isn’t it, that it evolves each season? I am very interested in the ideas behind minimalism, which means keeping only objects that you truly love and find useful. While undergoing a clear-out in the house, I cannot help but extend this practice to the garden too, and I am sure it will look far better as a result. Pots are ingenious in that they can be changed and moved around as per the changing seasons. Wonderful things. Thanks Jude – that photo of the hosta was taken at the start of the season. It’s looking slightly worse for wear nowadays, but I must say that the slugs have given it a wide berth compared with the other hostas, which have truly suffered. I don’t think they like the blue-leaved ones very much. I have read that they don’t like the thicker leaved ones, of which blue ones seem to be. I shall split mine this year and try it in the garden rather than the courtyard where the leaves touch the steps so make it easy for the s&s to climb on to! It’s a shame to see them shredded to pieces as they are lovely architectural plants. I think the slugs and snails will find their way onto the hosta wherever we put them! I am going to put mine in pots. Perhaps if I move them around it will take longer for them to be found by molluscs. Also the use of ‘sacrificial’ plants nearby, and of beer traps, may be of help. Mine is already in a pot, but the leaves touch the steps, so easy to climb on board. I might move it onto the gravel next year and see if the b**gers still fancy the walk! you are a writer and a gardener! What beautiful and inspiring pictures! The meadow rue stole my heart! I know all about the dense shade of the sycamore! Here, running vinca does well in spite of that. Thank you very much for your kind words. I do find Vinca minor a useful ally in situations like these. I love your work-so crisp yet whimsical too. 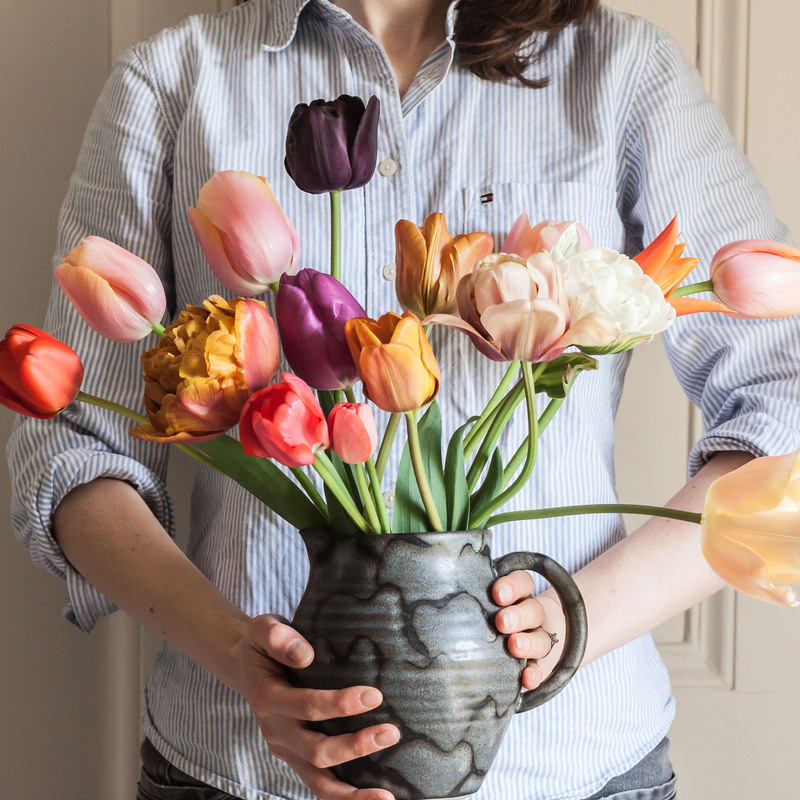 I have recommended your blog to a young florist here-her work reminds me of yours. I have a lot of vinca minor here-what a stalwart and dependable plant. How kind of you… thank you. Very inspiring … I will go and look at my garden through your eyes and, no doubt, be completely redesigning!! Oh, that’s wonderful. It’s always refreshing to have an overhaul (and most enjoyable too). I think it takes a while to be confident enough with gardening/plant knowledge to rip out plants that one doesn’t like but it is necessary to achieve a garden that you love. It also takes time, energy and resources to fill the gaps! There’s a lovely grass that thrives in dry shade called Luzula nivea, if you like grasses. Good luck with your redesign and I look forward to hearing all about it. Funnily enough Sam, I was just thinking about grasses last night, and which one(s) I might incorporate into the mix. It’s a windy spot and I would like to work with the movement of the plants (not that I have a choice!). I hadn’t heard of Luzula nivea, but I’ve just looked it up and it’s a most pretty grass with those beautiful white flowers. It may be just the very thing I need, so thank you for alerting me to its existence! I couldn’t be without them. I discovered your blog via a comment you left somewhere and am really enjoying it. Is there a categories list to search by or just the archive by months? I am a gardener/writer/visual artist and learned two tricks along the way. I always read some poetry when I am stumped as to how to begin to write and I use charcoal and pencil and get my paper “dirty” before I start drawing. That way the paper is already “ruined” and whatever I do will be an improvement. Of course, I like messy drawings with lots of marks which helps. I am growing 4 different Thalictrums and they add such a sense of mystery and movement. I live in the Upper Midwest is the USA where we have tremendous winds. So I can’t grow Delphiniums but the Thalictrums seems to be able to take lots more wind without completely falling apart. Have you enough light for Martagon lilies? They come up early and look great in bud and seed as well as flower. ‘Mrs. R.O. Backhouse’ is my favorite. Looking forward to seeing what you do as you redefine this space. Thank you for your kind words, Linda. I tend to categorise the posts by season, but otherwise I use tags, not very consistently. I should probably tend to the organisation of this blog as it’s probably not easy to find old posts. There was a recent article about Martagon lillies in our monthly RHS magazine. Such beautiful things, and there may be enough light for them in the spring, before the trees come into leaf. My delphs are all staked and for some reason do all right, despite the wind. But I think I will move them to the back garden as they’re not going to be quite right in my new design. The Thalictrum is definitely staying though! Ferns might do well. There are the ordinary ferny sort in many shapes and sizes, and some less obviously ferny types like maidenhair fern and the hartstongue variety. I bought a few native ones a few years ago and have some self sown ones growing in the yard where it is dark as you know. I do like the idea of martagon lilies, I have yet to succeed with them myself, but they would be a lovely plant to try. Jacques Amand is at Burghley, he might have brought some. Yes, ferns will most certainly be incorporated! I believe there are many that don’t mind a bit of a drought; I will have to look them up. Thank you Cathy. Just you wait till you see what I have in store for the front garden. It was really quite refreshing to take stock and have a good think about what I want planted, and what I wanted rid of. Hostas for example… love them, but they always look DREADFUL by about June. No use at all! I might keep my favourite little ‘Halcyon’ which survives better than the rest, but the others are destined for pots, preferably pots made of copper, when my ship comes in. Sounds exciting – I love the way inspiration can strike! Oh, forgot to say, I’d LOVE some baby ferns. Yes please! Oh, wonderful! Yes please. And if the dates work out we’d love to see you here, although my garden will be a bomb-site! I plan to add an indigenous one to cover our new rain water tank. Which is forcing me to rethink bits of my garden! Always good fun to rethink a garden and make new plans for plants, Diana. What types of clematis are indigenous to your area? I love using native plants across the garden.